Found 2 file extension associations related to Girder and 2 file formats developed specifically for use with Girder. 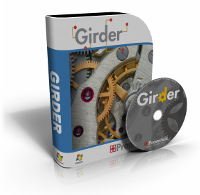 Girder is the award winning home and industrial automation software that allows users of all skill level to make advanced scripts and macros to automate many functions both on the computer and around the house or office. Based on the Lua scripting language, Girder is a graphical user interface that allows easy access to devices like lights, security systems, home theater, and any or all PC's functions including full application control for any program. If you need more information please contact the developers of Girder (Promixis), or check out their product website.